Repurpose old tires into a rotating compost container for your worms! Get several pieces of wood and lay them in a row at the location for your bin. Get several tires of similar size and cut off one side wall from each tire. Drill holes around the uncut wall of the tire for drainage. 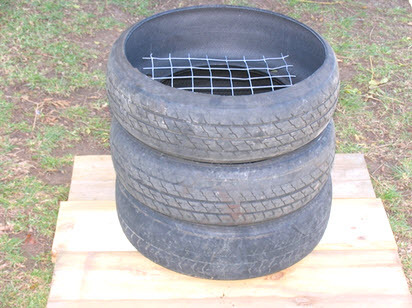 Cut pieces of sturdy wire mesh with large holes to fit in each tire. Stack the tires on the wood platform with the drainage walls facing downward and a piece of mesh in each tire.